CRYSTALS v14.23c installer is available to download for the Windows platfom. Allow omission of Friedel pairs of reflections from Absolute Configuration plots. Fixed crash on ‘Select All’ atoms for large structures. Fixed Hide/Show H button on toolbar. 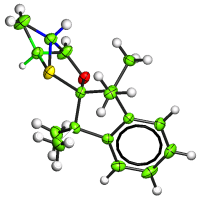 This is the final isolated intermediate in the synthesis of Neodysiherbaine A; crystals were very small, so data were collected on I19 at Diamond. The natural product is an excitatory amino acid isolated from the Dysidea herbacea Micronesian sponge by Sakai et al. Biological studies have shown that (–)-neodysiherbaine A is a potent convulsant and is a highly selective agonist for KA and AMPA glutamate receptors. (–)-neodysiherbaine A was a target as part of a research programme to develop new catalytic methods for the formation of heterocycles. Our retrosynthesis of this led to the disconnection of the central THF ring back to a hydroxyl alkene as a precursor for our recently developed Lewis acid catalysed oxidative cyclisation.